Whether you are an advocate of slow food or most of your nourishment comes from cans, the freezer, or drive-thrus, cooking and eating are integral parts of your daily life. But just how did we get to where we are today? Remember, at one point humankind didn’t even have mastery of fire. Now we have gas or electric ranges, rice cookers, regular and convection ovens, sous vide machines, and much more. 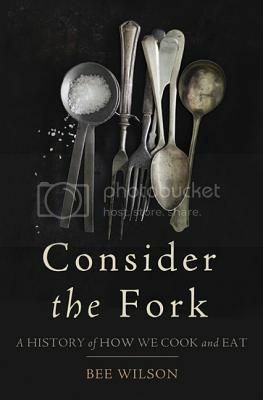 In Consider the Fork,Bee Wilson traces the development of many aspects of cooking and eating, including cutting implements, heat sources, cooling sources, and eating utensils. Although her focus is primarily Western Europe and, later, the United States and Canada, she does make mention of Asian innovations from time to time, particularly the Chinese ton knife and, of course, chopsticks. Consider the Fork is chock full of interesting things that you never knew about the ways that we cook and eat, such as the fact that the act of cutting food before we eat it (knife and fork eating in the West, ton and chopstick eating in China) actually seems to have changed the alignment of our mouths; an overbite is not helpful if you’re ripping all of your food with your teeth. Although that is the factoid that most impressed and stuck with me, Consider the Fork is packed with similarly fascinating information, such as how a woman from Boston influenced the United States into measuring things in cups, when weight is a much more useful and accurate measure for dry ingredients. A perfect read for both foodies and those interested in histories of specific objects, Consider the Fork is fascinating and a great read. Highly recommended. In 2010, the British Museum and the BBC teamed up to attempt to tell the entire history of the entire world in a mere 100 objects. Now, in addition to being available as an audiobook of the radio show, the director of the British Museum, Neil MacGregor, has put it all in book form, so that the discussions of the artifact and its importance in world history is accompanied by a photograph of said artifact. I haven’t had a chance to go through the entire book yet, because it is the sort of thing you dip in and out of, but what I have read is amazing. I just couldn’t wait to share this, in case it would be the perfect holiday present for someone (I was planning to ask for it, personally, before I happened to win it in a giveaway). Not only are the breadth of objects and the depth of discussion impressive, but so is the organization. There are 20 parts, each with 5 items discussed. Each part has a theme like “Empire Builders” or “Rise of World Faiths” and a time period. The artifacts are grouped in order to impart increased context and meaning, and the discussions often refer back to one of the earlier objects in that part. This allows the artifacts to be discussed in relation to one another, without losing the reader by referencing something 20 objects ago that may have been forgotten or not even read about. 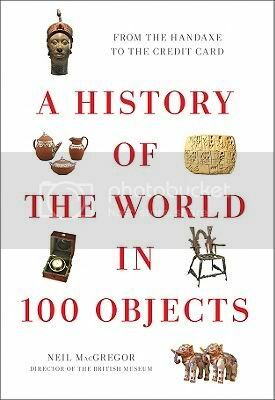 A History of the World in 100 Objects is a great conversation piece, but it is also an incredibly fascinating book for those fascinated in history and world civilizations. Very highly recommended, a fantastic holiday gift for history nerds! 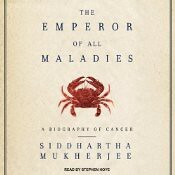 “The Emperor of All Maladies” is a sprawling and epic biography of cancer from its earliest mentions, through a rocky history full of misunderstandings, to the latest and greatest cancer drugs of the present. Almost 600 pages or 21 hours of a discourse on cancer sounds perhaps somewhat intimidating, but Mukherhjee has created a fairly comprehensive biography which can be easily grasped by laymen, but is still detailed. I cannot even begin to list all of the things I learned. The section which has stuck with me more than anything else is the discussion on carcinogens and how they actually cause cancer. My level of thought on that had always been limited more or less to ‘they do,’ without questioning the how. This is merely one example of how Mukherjee makes the reader examine what she thinks she really knows about cancer. I cannot think of a single section of “The Emperor of All Maladies” that failed to excite my interest and curiosity. Best of all, Mukherjee walks the line of intellectual and easily understandable with grace and ease. I was not terribly fond of Hoye at the outset, but he grew on me throughout the 21 hours of this audiobook. Largely I think he just got out of the way of Mukherjee’s work, but I think that was really exactly what needed to be done. Please see my review for AudioFile Magazine for more details. I would absolutely recommend “The Emperor of All Maladies.” Whether you partake in print or audio should be determined by the purpose you have in reading it. If you are already a medical science-minded person and want to really get in depth with the details Mukherjee provides, that is often best served by print. However, if you are like me and are looking more for a comprehensible overview of cancer and the history of cancer, audio is a great choice to keep you from getting too caught up in technical jargon and still give a good, comprehensive overview. Perhaps no American has inspired as many myths and legends as George Washington. He chopped down a cherry tree, he fathered a child on one of his slaves, he was an incredibly religious man, he was offered the monarchy of this new country, he slept about a million places, he was all but a god in mortal clothing, he was all too human. There are nearly as many American myths about Washington as there are Americans, and each age of our country has seen a new iteration of the man. In “Inventing George Washington,” Edward G. Lengel explores the myths that have grown around Washington in the over 200 since the founding of the country. Particularly interesting is the idea that are the country’s mores and national mood changed, so did the recreation of the Washington legend. Washington as a reflection of the country’s self-identification is a very interesting idea, and is explored very well throughout Lengel’s work. In fact, the content in general is fascinating. However, the writing, while not precisely dry, lacks a certain spark that would make the book truly engaging. The prose is serviceable, to be sure, but does not command the sort of fascination that might be expected. I am slightly divided on “Inventing George Washington,” Lengel certainly knows his material and presents it in a clear and concise manner, but the writing leaves just a little something to be desired. In 1811, in the relatively laid back and peaceful time between Christmas and Mardi Gras, a group of slaves in Louisiana rose up violently against their masters and turned their sights on the city of New Orleans. According to some sources, as many as 500 men may have been involved in the rebellion, which was headed by two men who had been raised in a marital environment in Africa, and yet the revolt is hardly mentioned in the history books, glossed over for the smaller slave uprisings of Nat Turner and John Brown. In “American Uprising,” Daniel Rasmussen both gives this event the attention it deserves, and explores the reasons that it has been largely disregarded in the story of American politics and slave relations. Rasmussen has fabulous style for a writer of nonfiction. He is clear and concise – the entire book is under 300 pages – managing to support his assertions well, without getting nitpicky. In addition to all that, his prose is incredibly engaging, and he makes the most of his thrilling subject matter to keep the reader turning the pages, without giving way to sensationalism. The lead up to the revolt itself is almost nail-biting, engendering both intense sympathy for those rising up against enslavement and fear for the possible death toll. That being said, the story of why the history of this rebellion was de-politicized and suppressed was perhaps the most fascinating part of “American Uprising.” It was also the section that ran the greatest risk of being dull, but Rasmussen built on the interest he generated in the rebellion earlier in the book to make this less action-packed section equally compelling.